Jan Riha leads after Day 1a of the 2016 Unibet Open London Main Event. A total of 186 players ponied up the £875 buy-in to enter the first of the two starting flights in the Unibet Open London Main Event. Just 51 players, or less than one-third of the starting field, advanced to Day 2 and they will join the other survivors from Day 1b's play on March 5 for when the combined field plays forward to the final table. Currently, the Czech Republic's Jan Riha has a commanding lead with 298,800. Riha had the lead since the dinner break and never let up with his stack bouncing between 250,000 and 300,000 chips most of the time. Also ending the day on a good note was Norway's Geir Reka Tollerud with an impressive 263,500 in chips, followed by France's Erik Le Goff in third place with 242,500 in chips. The Koops family has a reason to celebrate after Day 1a as well, as identical Dutch twins Erik Koops and Alexander Koops finished with 192,600 and 128,000, respectively. Also still in contention is Frenchman Antoine Saout who is one of the most successful players to enter the field. Saout has approximately $4.4 million in career live tournament cashes with his claim to fame being a third-place finish in the World Series of Poker Main Event for about $3.5 million. Unibet Poker also sponsored three eSports players today in Craig Shannon, Byron Bernstein, and JJ Janssen, plus Belgium's Charlotte Van Brabander. The three eSports stars of Shannon, Bernstein, and Janssen all exited the tournament early, then Van Brabander exited a bit later. All four fell before the dinner break. Remko Rinkema interviewed the trio of eSports stars about not only their experiences in the Main Event, but also the previous day in the single-table sit-and-go Unibet Open London eSports Battle, which Van Brabander won. Play will resume Friday at 12:00 GMT. 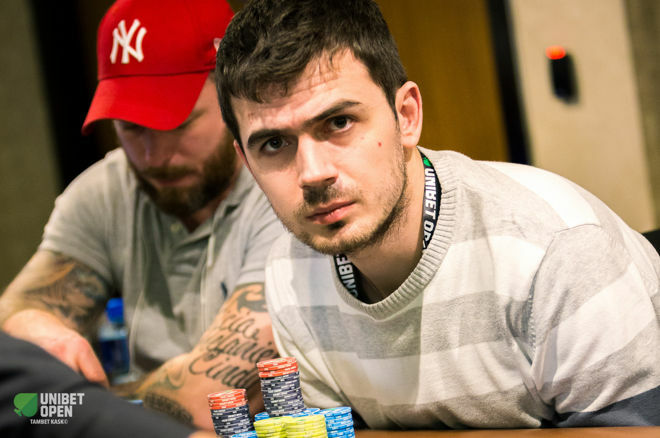 One player expected to be in attendance is Unibet Poker Pro Quentin Lecomte. Stay tuned to PokerNews for continued live coverage. PokerNews is your place for coverage of the 2016 Unibet Open London Main Event, and you can follow along by clicking here. If following this event has got you excited to play in a Unibet Open tournament, then let your good friends at PokerNews help you reach that goal. Click here to check out our Unibet Poker review page, where you can sign up, get a nice bonus for doing so, and then get started trying to qualify for the next Unibet Open.